We've been hearing about it for months, and today the MusicGremlin service was launched, featuring a $299 WiFi-enabled music player, the Gremlin MG-1000. The subscription service is $14.99 a month or 99 cents per song, and you don't even need a PC to use it, either—just access a WiFi network and you can download music directly into the player. 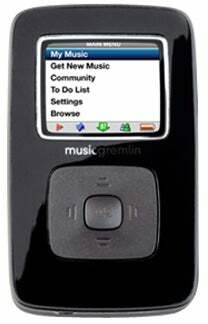 Or, you can download songs on your PC and transfer them over to the Gremlin. You can even communicate with other Gremlins via WiFi and transfer music back and forth between them. The player itself has a 2-inch 320x240 screen, 10-hour battery life, uses wireless 802.11b and is about the same width as an iPod and weighs slightly less, but it's a bit thicker. And a lot uglier. Too bad it holds just 8GB of MP3 or WMA files. We're thinking that if the MusicGremlin service is out to kill the iPod and iTunes, it's going to have to spruce up a bit. But on the other hand, there's that WiFi thing. The plot thickens.